Clear skies. Low 57F. Winds NW at 10 to 20 mph..
Clear skies. Low 57F. Winds NW at 10 to 20 mph. Super Duper Coffee Toffee and Super Duper cheddar Wedges are two of Mary Cooper’s popular HappySnax. Mary Cooper, a Galvestonian who now lives in New York, started making selling her HappySnax online nearly a year ago. Super Duper Spicy Rosemary Nuts are one of Mary Cooper’s popular HappySnax. Mary Cooper, a Galvestonian who now lives in New York, started making selling her HappySnax, including her Super Duper Spicy Rosemary Nuts, Super Duper Coffee Toffee and Super Duper Cheddar Wedges, online nearly a year ago. Yes, Virginia, there is a Mary Cooper, and she recently visited her hometown, Galveston, with more of her artisan snacks in hand. Now a resident of New York City, where she produces all the items in the HappySnax line, she spent Christmas on the island with her mother, also named Mary Cooper. Cooper grew up in Galveston, the hometown of her mother and her grandparents, Dr. Titus and Laura Harris. She attended Trinity Episcopal School, Lovenberg Junior High and Central Middle School, acquiring the “Super Duper” nickname at the University of Texas. 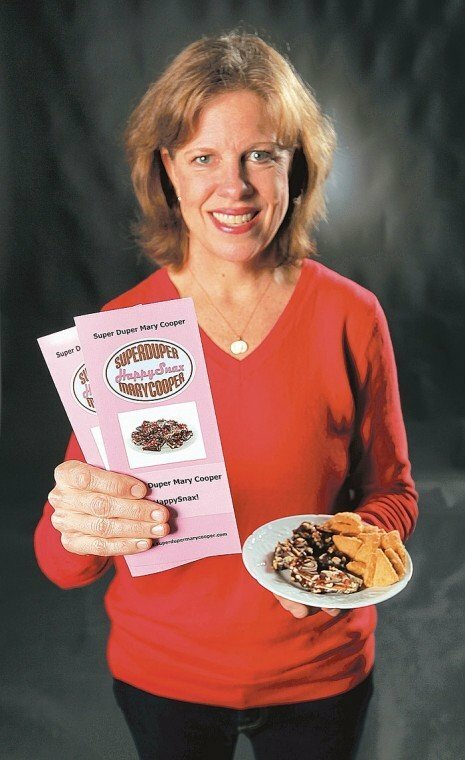 “In 2011, when I went to incorporate my business, every variation of “Happy Snacks” was already taken, so I registered it as Super Duper Mary Cooper,” she explained. 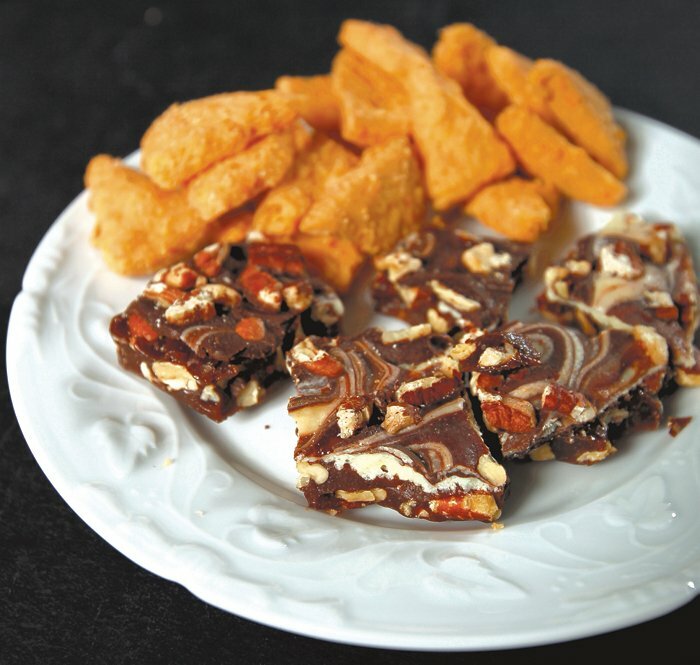 The HappySnax line now includes Cheddar wedges (described by one customer as ”like goldfish on crack”), rosemary-spiced nuts, coffee toffee, peppermint cream patties, and Hello Dollies, the chocolate pecan that Cooper made in high school. Before starting her business, Cooper worked on Wall Street, attended the French Culinary Institute, and earned a degree from SMU’s Graduate School of Business. “In the late 1980s, I wanted to follow my passion for cooking, but I decided I couldn’t apprentice as a cook and still pay rent in Manhattan,” she said. Instead, she limited her cooking to friends and family while enjoying a long career at Thomson Reuters. The marketing skills she honed in her career have been equally important to her success. Cooper’s Etsy storefront led to an appearance on Martha Stewart’s television show. “She did a special episode with an entire audience of Etsy sellers, and we were able to bring our products for photographs,” she said. For 2013, Cooper’s goals include placing her products in retail stores. “I don’t think I’m going to expand on my product line this year, but now that I’ve been through the USDA approval process, I can sell in stores.” Meanwhile, her HappySnax are available for purchase online at superdupermarycooper.com. Heat the stock on its own pot. Keep it hot (not boiling) throughout the preparation. Heat a large saucepan or sauté pan on medium heat. Add olive oil (I don’t measure....just nicely coat the bottom of pan). When the oil is hot (not too hot though), add chopped onion and stir. Do not let onion burn. You may need to turn it down a little bit. After about 4 minutes, add garlic...once again, don’t let it burn. You are “sweating” the onions and garlic. After about 2 minutes, turn the heat up to high and add all of the mushrooms. Stir the mixture continuously. You are “sweating” out the water of the mushrooms. When you are happy with the sautéed veggies, turn the heat back down to medium, add the rice and stir...you are now “toasting” the rice. After about 1 minute, pour the wine all at once and stir until the wine evaporates. Add about ½ a cup of the stock and stir. When the stock is virtually absorbed, add another ½ cup. Continue to do this until you only have a little over ½ cup left. Turn of the rice and remove from hot burner. Taste and add salt and pepper now. The cooking of the rice to this point should have taken about 15 minutes. Turn the rice back on medium heat and warm up the remaining stock. Stir the rice mixture. Add the remaining stock (if you need more liquid, just add a little more stock or water). Mix in the parmesan cheese. Taste for seasoning and adjust if needed. Stir in 1 tablespoon of butter and pour into a serving dish. Sprinkle chopped parsley on top. Serve with additional parmesan cheese on the side. 2. Blot sausage dry with paper towel and combine crumbled sausage, cheeses, dressing, olives and red pepper in bowl. Toss to mix. Slightly grease mini muffin tins and press 1 wrapper into each cup. Brush with oil. Bake for 5 minutes, until golden. Remove from the tins and place on baking sheet. ***If you use phyllo shells, then you do not need to grease the tins. Bake for about 2-3 minutes prior to filling. There was no nutritional information on the website. A basic like calorie content would be helpful.